Transparent Uptime: What if the cloud disappeared tomorrow? Thoughts on a "Online Users Bill of Rights"
What if the cloud disappeared tomorrow? Thoughts on a "Online Users Bill of Rights"
NPR did a story on the (often unexpected) risks involved in storing your data in the cloud. What would you do if Gmail, Flickr, or Yahoo decided they no longer cared to store your massive amount of free data and ran a large "rm -rf". Sure they'd get some pretty bad PR, but if you look at their EULA's, I'm betting they have the right to do this. Can we ever trust that our data is really safe in the cloud? 1. Files, documents, or anything else that the user has created and saved online cannot be removed or be made inaccessible without a 30 day advanced notice. 2. The service must be accessible 95% of the time each month. Specifically, users must be able to access their data, be able to delete or retrieve existing data, with availability of at least 95% in each month long period. It is also highly encouraged to make public a tighter uptime commitment, including the consequences of not meeting that commitment. 3. During downtime events, the service must make a best effort to provide status updates, estimates as to when service will be restored, and an explanation of what led to the downtime after the event. It is also highly encouraged to make known a central location to distribute this information. 4. The service will provide a performance SLA describing the average page load time they expect to see, and the consequences of not meeting that average in any given month. This is especially important for API's and services like AWS. 5. The service must give at least 30 days notice prior to making any "major" changes in the functionality or level of service provided up to that point (including API interfaces). It is also highly encouraged to involve the users in the decision making process prior these changes. This Bill of Rights would need to be signed off on by any online service that stores data for users (Google, Yahoo, Flickr) or provides online service that other business rely on (Amazon AWS, Salesforce, API providers). I'd like to see the day when users simply do not trust online services that aren't willing to sign off on this. The above is just a first draft, and I'd love to get some input on this. I would purposefully keep the list somewhat open to interpretation, staying away from legalese, and focusing on the spirit of the idea of transparency and user rights (similar to the concept of a B Corporation). 1. 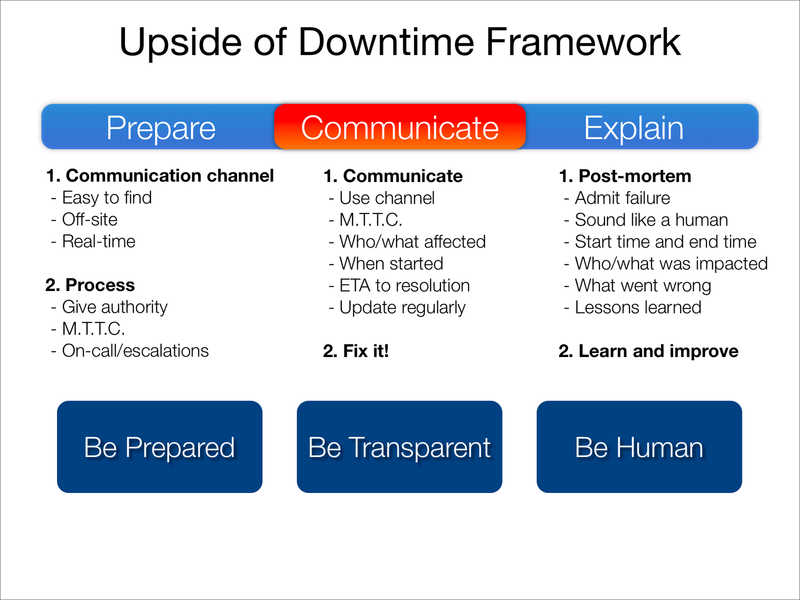 SLA's must be defined in such a way that anything under the control of the provider that leads to the customer being unable to use the service at any time (planned or unplanned) is considered downtime. 2. SLA's must be validated by a third party.